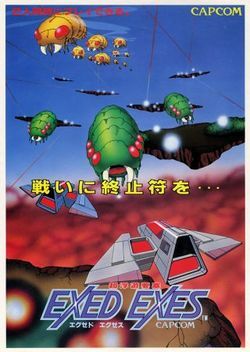 Exed Exes is an arcade vertical shooter developed by Capcom. It was licensed to Memetron and released outside of Japan in the arcades as Savage Bees. It uses similar hardware to Capcom's 1942, but it is more of a spiritual successor to Capcom's earlier shooter Vulgus. It takes place in a science fiction alien hive where you must pilot your ship through many stages protected by insects, some as large as your craft, and some even larger. What made Exed Exes stand apart from other shooters, besides the high resolution graphics for its time, and the detailed use of parallax scrolling to indicate depth, was the fact that it was one of the earliest vertical shooters to allow for two player simultaneous play. Rather than waiting for one player to take his turn, two players could enjoy the game at the same time, and even work cooperatively to get further along in the game. The only system that Exed Exes was ported to was the Famicom, converted by Tokuma Shoten which was an entertainment publisher in Japan. They ran a contest in one of their magazines that asked players to submit a secret code word that appeared at the end of your game, based on your score, and players could win special stickers that could be applied to their cartrdige. Cartridges with these stickers are highly sought after by collectors. Exed Exes never saw another release until it was contained in Capcom Generations 3 in 1998 for the PlayStation and the Sega Saturn. It was later included on Capcom Classics Collection for the PlayStation 2 and the Xbox, and on Capcom Classics Collection Reloaded for the PSP. This is a tale of a planet that lies 6000 light years from Earth. The mighty insect type creatures EXES grew in technical prowess, and came to devise an attack against the humanoids on NEG-NIN. In response to the surprise attack, scientists built two mechanisms to repel the EXES, The Colonel Issue, and the Sargent Issue. However, the classified weapon "EXED-EXES" of the EXES also seems to be near completion. Hurry!! You only have one day to annihilate the EXES army. Each player controls the Colonel or Sargent Issue craft. The crafts can fly throughout most of the visible screen, constantly scrolling vertically upwards. The crafts can fire a gun with unlimited ammo up towards the top of the screen, and have a limited supply of crash bombs, which only destroy enemy shots and bombs. The player will lose one ship if hit with an enemy bullet, or collides with an enemy or bomb. When a power-up icon appears, collect it to increase the power of your main weapon. Larger insects will appear from time to time which take more shots to shoot down. A stage boss will appear at the end each stage. Every skull and turret on the craft must be destroyed in order to advance. This page was last edited on 29 March 2010, at 08:26.